When going camping, there are a huge number of things you need to keep in mind, that are essential and must be carried with you. Camping is a fun activity that also promotes exercise, but without the bare essentials, you will quickly find yourself in a spot and might even have to cancel the trip. That is why the free Time Sheet Templates are excellent samples with which you can create your own backpacking checklist. It is similar to a vacation checklist. You can also see Checklist Templates. 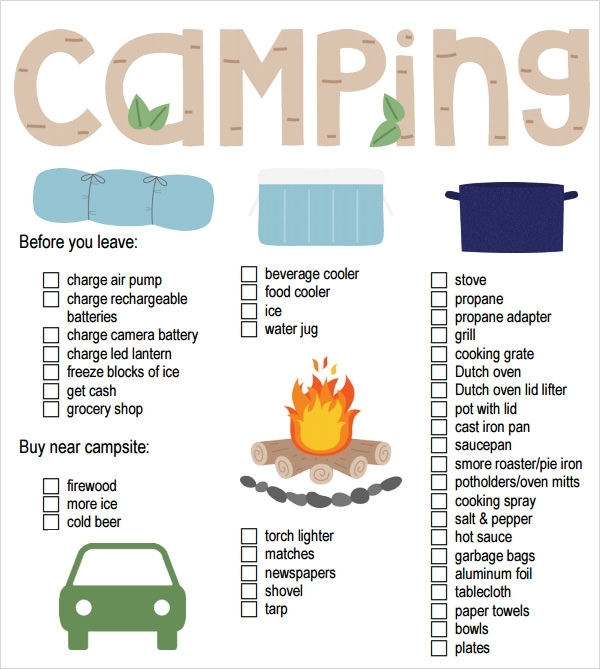 The camping gear list can also be used as a sort of reference when beginning a journey, to make sure you have everything you need and at the end in order to make sure you do not leave anything behind, like a packing checklist. This template is the best for a group of families camping together. It is an efficient excel spreadsheet with rows having the family or group names and with columns divided into categorized attributes such as food supply, bedding items, first aid etc. 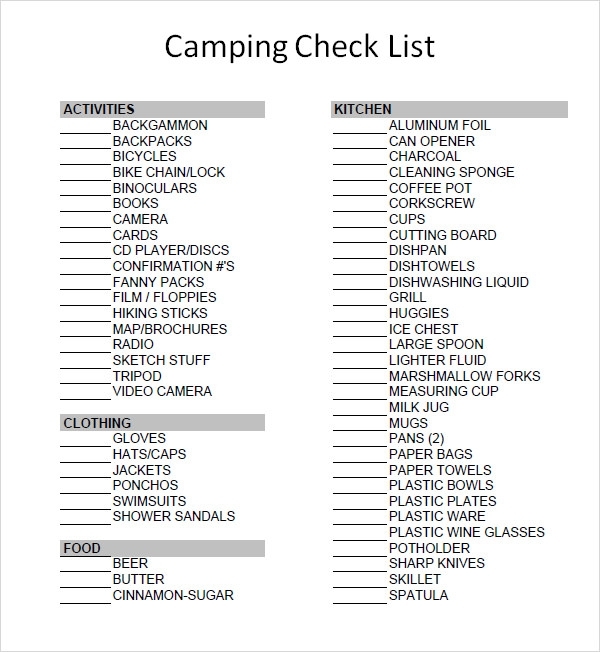 For first time campers, this list helps cover all the do’s while packing and what to gather before settling in a selected location. Even the smallest and what may be seeming insignificant yet important requirements are mentioned in this list. 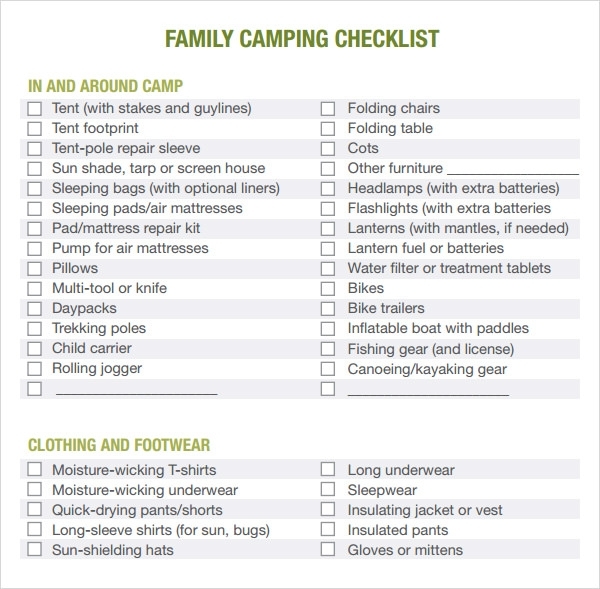 When two or more generations of a family camp together, this checklist can turn out to be a handy one. This is a simple page covering all requirements grouped as titles, and each title has many options that can one can strike out when taken care of. 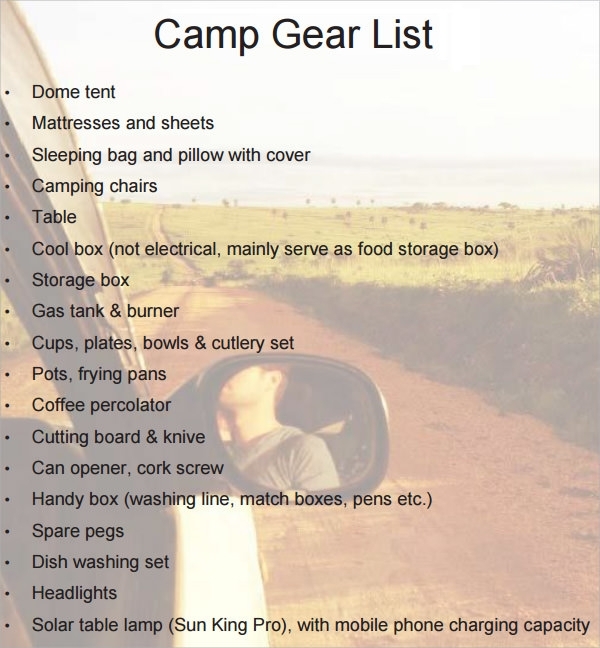 For those exploring unknown destinations on road, this list gives the items required namely food supplies, appropriate clothing, beddings, tool box, and basically all commodities while travelling over long distances for days without checking into a hotel or an inn. 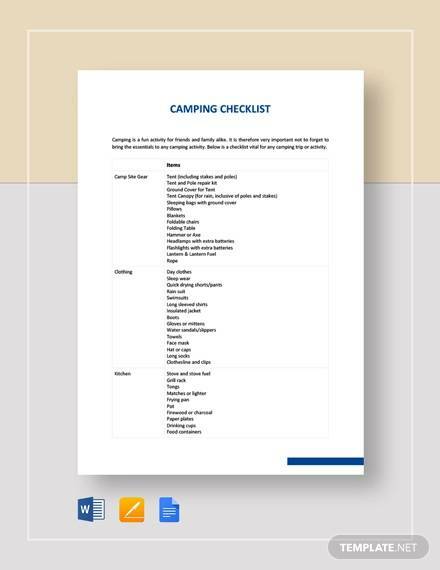 The templates can be stored digitally and distributed through the internet to the other parties who are involved in the camping trip so they too can benefit from the checklist’s information. Every trip planned and can proceed in a hassle free way if there is a list made, used and followed. Camping sites can often be isolated or cut off travelers from connectivity. A checklist thus forecloses such circumstances making the camping worth the time and excitement. Backup supplies seen in a list are not mandatory, yet can often be life saviors, because shortage of food, first aid or clothing can never be predicted before the camping unravels its course. 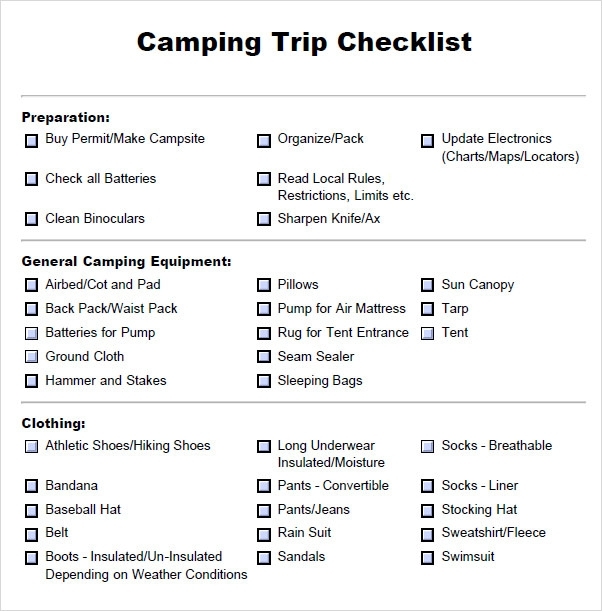 The basic purpose of a checklist is to ensure that we do not carry unnecessary baggage while leaving behind materials compulsory for a safe and satisfying camping. 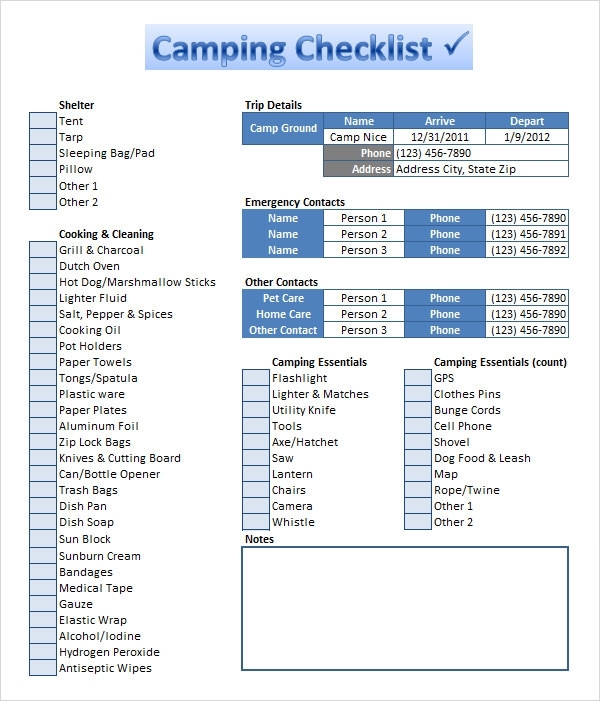 When To Make A Camping Checklist Template? The day a camp trip has been scheduled is the perfect time to start making a record of the requirements. Proper research of the camp site tells a lot of what one can look forward to and how to extract only the best out of it. If not then, a week before the camp is high time because procuring all stocks is a time-consuming task. For a weekend camping in a nearby site, a day or two before is the ideal time. Note down the materials required when all members of the camp are available for listing items required in bulk. You can also see Sample Daily Checklist Templates. 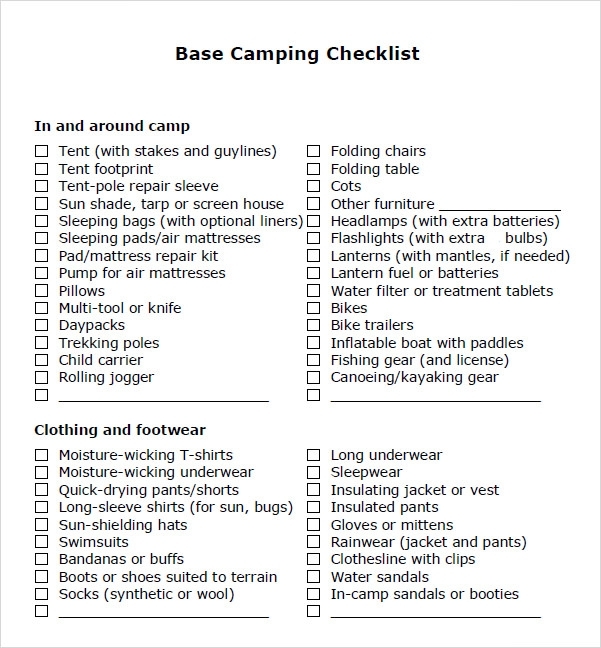 How to Make a Camping Checklist? Creating a camping checklist requires few moments of thoughts over the place being visited to setup camp, strength of camping team to fix bedding supply, the prevailing climate of the location, nearby towns or cities that is within half a day’s reach, food supplies that will cater to everyone’s health and taste, sanitary needs and finally torches and matchsticks which are inevitable. For those planning for camping in forest areas, do include proper stock of insect repellents in the list, similarly according to the area, specific commodities are accountable. Once this basic survey is done, one can move on to the secondary requirements such as tool box, mini freezer, candles and others! 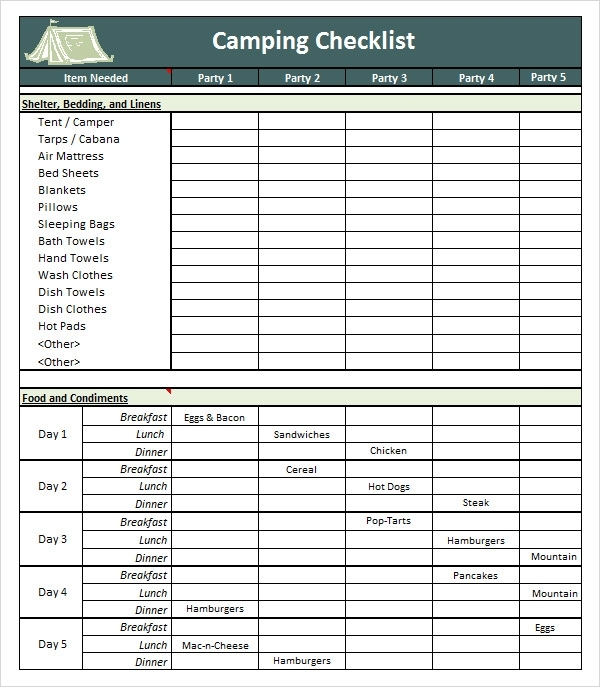 The camping checklist template contains a basic structure with which you can include all your camping recipes that are easy to make while out in the wild, away from the comforts of a kitchen.You can make a camping checklist for kids and make sure you have packed all the essentials for their well-being. You can also see Sample Project Checklists.